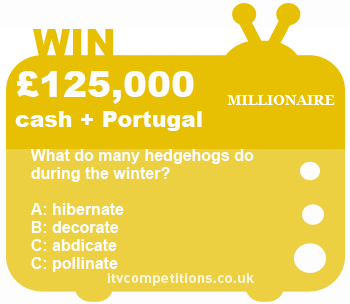 Who Wants To Be A Millionare competition – win £125,000 cash + 7 night holiday to Portugal for 6 people!!! Competition closes for entries online at 12.00 p.m. on Wednesday 16 January 2013. What do many hedgehogs do during the winter? The 2nd part in the 2013 Who Wants To Be A Millionaire celebrity special! Enter the Millionaire competition 6 times per phone number for free via the itv.com competitions entry form (texts & phonecalls cost +£1.50! ).